If I had to name one film this year that would epitomize a truly 'faultless' film, it would have to be "Shakespeare in Love". It is rare to see a film in which the performances, writing, narrative structure, direction, humor, and production design combine to create an outstanding and enchanting piece of work that is in essence, pure poetry. Kudos to director John Madden ("Mrs. Brown"), and scribes Marc Norman and Tom Stoppard ("Rosencrantz and Guildenstern are Dead") for validating that it is still possible to conceive a film that works so well on every level. At its core, "Shakespeare in Love" is your prototypical romantic comedy. And while romantic comedies have become rote as of late (witness "You've Got Mail"), this film breathes new life into this seemingly creatively-bankrupt genre. 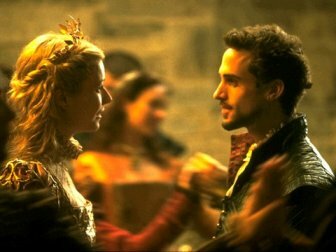 In this case, the year is 1593 and the romantic lead is Will Shakespeare (played by Joseph Fiennes, seen most recently in "Elizabeth"), the Bard himself. Unfortunately, Will is struggling for recognition in the crowded world of Elizabethan theater, competing with his more well-known contemporaries, such as Christopher Marlowe (an uncredited Rupert Everett, last seen in "My Best Friend's Wedding"). Even more distressing, Will is suffering from writer's block over his latest play, a comedy entitled "Romeo and Ethel the Pirate's Daughter". With no love in his life, Will finds it difficult to be inspired, much to the chagrin of theater owner Philip Henslowe (Geoffrey Rush of "Shine" and "Elizabeth"), who is hoping for a hit play that will help him settle some long overdue debts. However, Will 'finds his muse' when he catches a glimpse of Viola de Lesseps (Gwyneth Paltrow of "Sliding Doors"), the beautiful daughter of a wealthy merchant. The attraction is mutual, as Viola finds Will's writing poetically enchanting, and aspires to perform in one of his plays. The only problem is that Viola is already betrothed to the heartless Lord Wessex (Colin Firth), a union sanctioned by Queen Elizabeth (Judi Dench of "Tomorrow Never Dies") herself. Invigorated by Viola's visage, Will puts quill to paper and his comedy begins to take shape. Meanwhile, Henslowe starts gathering actors for the production, including the self-absorbed master thespian Ned Alleyn (Ben Affleck of "Good Will Hunting"), some assorted riff-raff from the local watering hole, and an enigmatic but talented young man named Thomas Kent. Unbeknown to Will and the rest of the troupe, Thomas is actually Viola in disguise, as it is deemed illegal and immoral for women to appear on the stage. Like many of the plots found in the Bard's work, complications arising from mistaken identities, gender-reversal, and deception will threaten to keep the two star-crossed lovers apart. There is so much to rave about in "Shakespeare in Love", that I do not know where to begin. First and foremost, the performances are strong all around, especially with the undeniable chemistry between Paltrow and Fiennes. Paltrow radiates an irresistible screen presence, and her ardent portrayal of Viola effectively conveys the passion that her character is meant to exude. She also brings a new appreciation to the oft-heard lines of "Romeo and Juliet" with her distinctive and impassioned elocution, and even those who find Shakespeare uninteresting will sit up and take notice-- Shakespeare has never sounded so good. Fiennes is ideally suited for portraying Shakespeare, with his ruggedly handsome features and his charming disposition. His adept handling of the material doesn't hurt either. Affleck, Rush, and Firth manage to steal some of the limelight with their memorable performances. 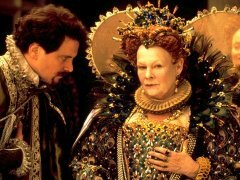 Dench is also a welcome addition to the ensemble with her portrayal of a Queen Elizabeth with attitude to spare. The well-crafted script also elicits excellent performances from the supporting cast, providing every member of the cast, no matter how small the part, a shining moment. Second, the film's very smart script is a perfect composite of modern sensibilities and the lyrical articulation of Shakespeare's better works-- those familiar with the Bard's writings will be delighted with the film's numerous and witty references, and those not-so-familiar will still find the situational humor entertaining. The script also marvelously juxtaposes the action on the stage with the budding romance between Will and Viola, adding a whole new layer of subtext to the proceedings that adds to the film's bittersweet emotional build-up. Finally, the film's weighty third act is executed perfectly, reconciling all of the film's narrative threads during a performance of "Romeo and Juliet" and providing the audience's pent-up emotions the opportunity for a welcome release. It is not very often that a film like "Shakespeare in Love" comes along. Remarkably well written, superbly acted, and adroitly executed, this is one truly satisfying, entertaining, and literate film. 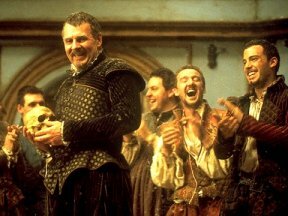 Not only is "Shakespeare in Love" an instant classic, but it is also a tribute to one of the most beloved and well-known writers of all time. Images courtesy of Miramax Pictures. All rights reserved.